Let’s be honest, first birthday parties are more for the parents than the guest of honor- who is too small to remember any of it. 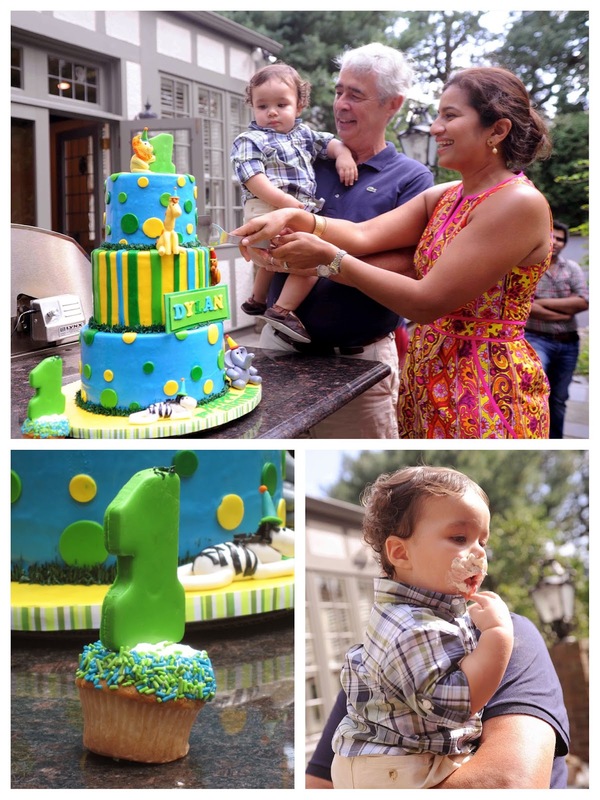 First birthdays range from elaborate celebrations to intimate family dinners. We did both for our nephew, Dylan. Picking out the theme for his party was a piece of cake! 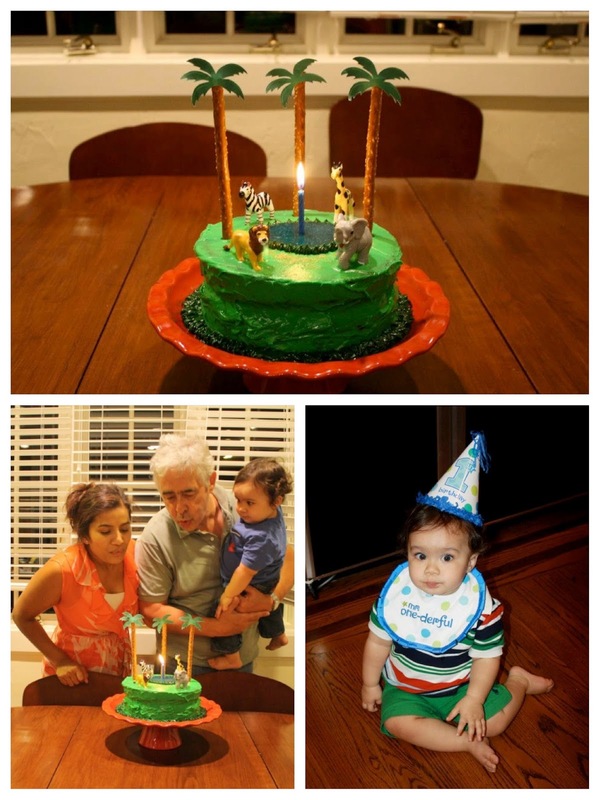 His nursery was decorated with safari elements and his monthly birthday stickers featured various safari animals. We set up a large tent in our sister’s yard. 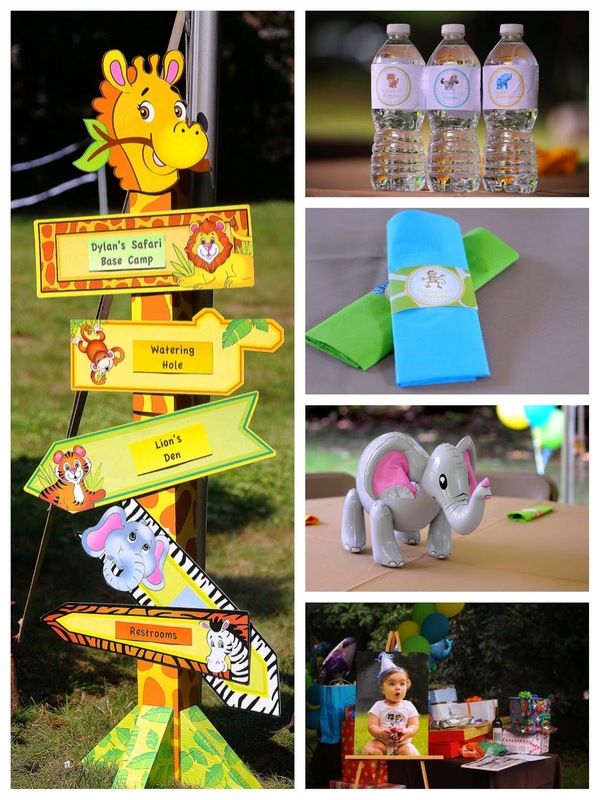 We found an adorable bamboo welcome sign and customizable giraffe sign from Oriental Trading. We had fun renaming the key locations with safari lingo: Safari Base Camp, Lions Den, Watering Hole. 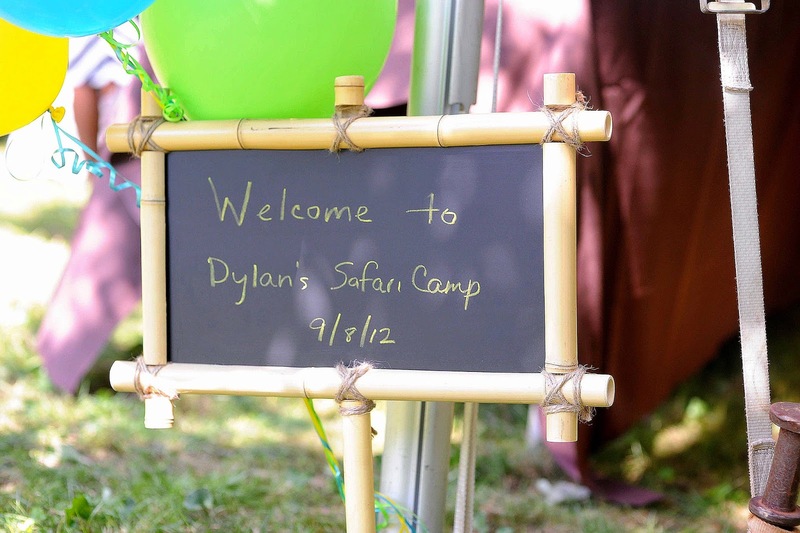 We created a Happy Birthday Dylan banner from colorful Safari cardstock. We have a “no shoes” policy in our family – so we put up a funny sign that said “no shoes, paws only” on the front door and used paw prints to direct guests to the restroom. The water bottles featured various safari animals. We wrapped safari tags around the napkins to enclose the cutlery. We selected kiwi green, carribean blue and sunshine yellow as our color palette. 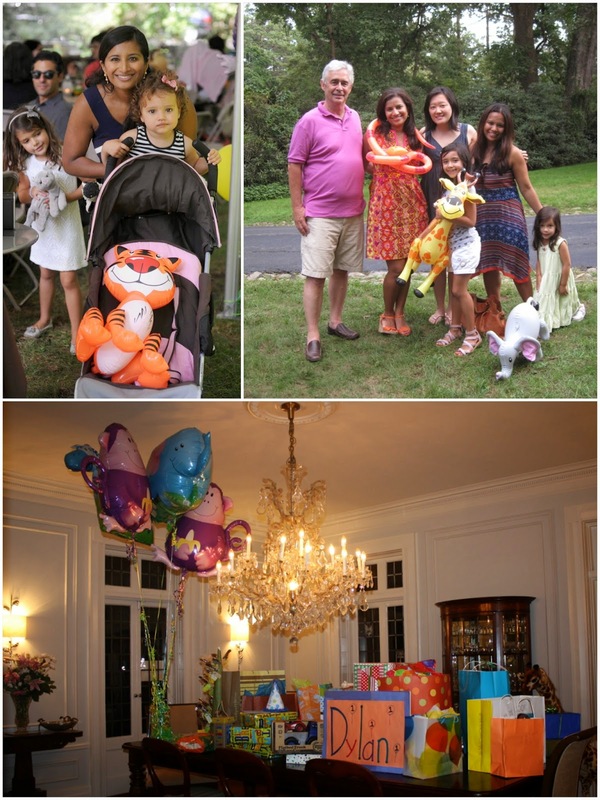 Jonathan’s Balloons created beautiful boutiques that combined latex ballons with a Mylar safari animal. Unfortunately, it was so windy that day that we had to wrap the boutiques around the tent poles instead of using them as table centerpieces. Luckily we also had adorable inflatable safari animals and used those as replacement centerpieces. We printed a large poster of the birthday boy and placed it by the gift table. Our caterer, Claire Lobello, created a delicious menu inspired by the safari theme. We had so much fun creating the safari themed dessert bar. It was a joint effort between us, our caterer and our favorite bakery. Sugar cookies naturally lend themselves well to themes. We found cute safari cookie cutters on Amazon and baked “sugar cookies from the Serengeti” in the shape of giraffes, zebras, elephants, monkeys and lions. We also created chocolate covered tiger berries and marshmallow leopard pops. Our caterer made delicious monkey banana bread, zebra brownies and passion fruit mousse. She also carved a turtle out of a watermelon, which was filled with fresh fruit. The star of the dessert table was the beautiful three-tier mousse cake created by Mother Mousse. Their amazing cakes are light and moist and have just a thin layer of fondant. 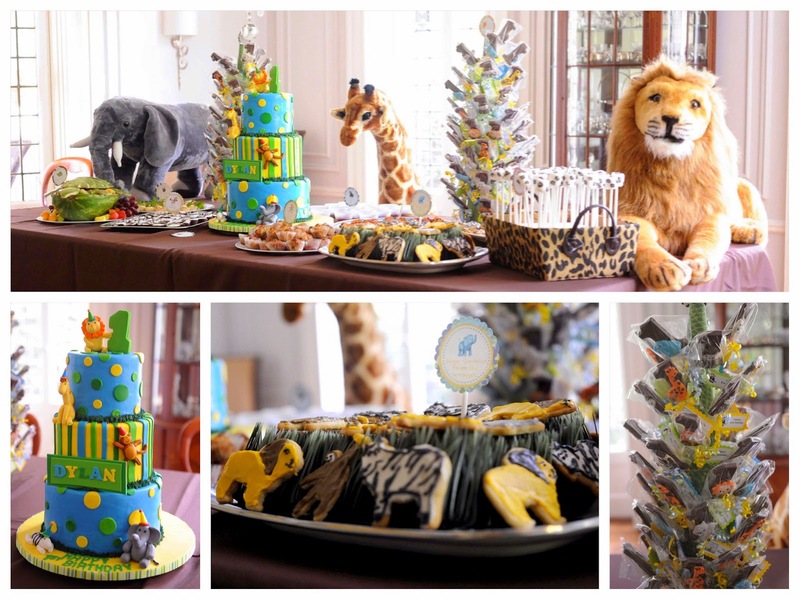 They decorated the cake with an adorable fondant lion, monkey, zebra, elephant and giraffe. Dylan also got his very own smash cupcake. We placed the chocolate lollipop favors on the dessert table. Hannah Sweet Chocolate Dreams created adorable lollipops that featured the number one and and a safari animal. We used large Melissa and Doug stuffed animals to complete the safari display. The inflatable animals were also excellent props for pictures and the kids got to take them home in addition to their chocolate safari lollipops. Favors for the infants were stuffed animals. This special little boy had another party on his actual birthday. The intimate family celebration began with opening presents and concluded with Baked By Archana’s delicious blue velvet safari cake. The cake was decorated with green cream cheese frosting, Wilton safari cake toppers, tall pretzel trees and a watering hole. Previous Post Calling All Superheroes! Next Post Happy St. Paddy’s! What a lovely idea for a birthday party, it looked like a lot of fun and the cake looks incredible! I love the little sign "No shoes paws only" What a wonderfully cute way to let guest know your home is a shoe free home. This is such a cute party theme. And very well put together. This is absolutely adorable! I love the idea and it's a beautiful party, you should be very proud of yourself. Every single detail had me smiling! The "no shoes, only paws" melted my heart. Aw, what a lovely party! this is precious! 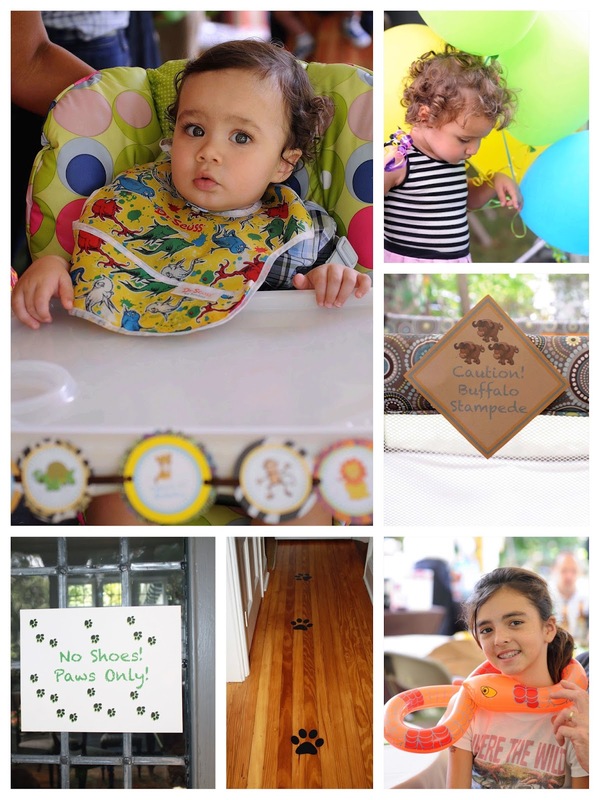 what a fun party for a little one, I'm sure everyone had a blast!